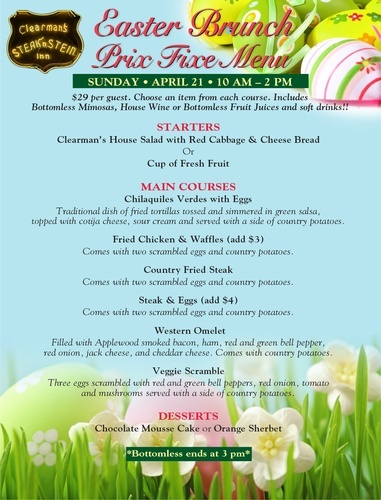 Clearman's Steak'n Stein Inn in Pico Rivera is again offering its popular Easter Brunch this Sunday! The Prix Fixe Easter Brunch begins with Clearman's house salad with red cabbage and cheese bread, main courses offer chilaquiles verdes with eggs, fried chicken and wafffles (add $3), country fried steak, steak and eggs (add $4), western omelet and veggie scramble, desserts and choclate mousse cake or orange sherbet. Bottomless mimosas, house wine, fruit drinks and soft drinks will be served until 3pm.